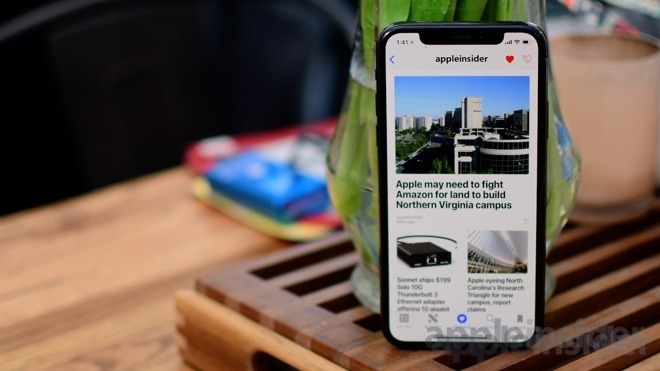 News outlets have seen extensive growth in readership within Apple News as of late, with many prioritizing its audience over other forms of distribution. The only issue? Few — if any — have been able to actually monetize it, according to a new report. The recent claims were outlined in an extensive report that highlights the potential pitfalls of embracing Apple's pre-installed iOS newsstand. Numbers shared by Slate are quite telling. The publication has experienced a huge increase in traffic from Apple News, yet it is largely unable to monetize that influx of new readers. In fact, Slate earns more money from an article that pulls 50,000 views on its site than 54 million page views on Apple News. The report, citing sources, says other news outlets are seeing much the same, with Apple News now ranking as a top traffic driver alongside Facebook and Google. Since launch, Apple News lacked support for many of the common ad platforms used by online publishers. While it recently added support for Google's DoubleClick ad manager, the platform's restrictions mean articles viewed in Apple News display far fewer ads than the same content on a publication's site. Further, the ads that are shown in News don't earn much. The big difference between Facebook's audience and that of Apple News is that Facebook routed readers to the publication's website, where page views translated into ad impressions. Apple News, on the other hand, keeps users within the app itself, largely restricting the number and types of ads that can be displayed. Yet publications are not jumping ship. Indeed, many are embracing Apple News, hoping for a turnaround. The app comes pre-installed on every iOS device, opening the door to a massive potential audience considering there are over a billion iPhones and iPads in use around the world. Apple News is also coming to Mac for the first time thanks to macOS Mojave. Another plus for publishers is human curation. Like Apple Music, Apple employs editors — not algorithms — who parse through the daily news grind, accept pitches and communicate via Slack to select top stories, some of which are pushed out to readers in the form of device notifications. The recent surge in Apple News readership comes as Facebook has seemingly culled the amount of content that appears in users' newsfeeds, a response to increased criticism over "fake news," its part in Russia's interference in U.S. elections and seemingly lax data privacy practices. Facebook was the place to be for news outlets a couple years ago, but traffic is not what is used to be for many news and media companies. Google AMP, Twitter and Apple News were among those outlets to see increases as Facebook's faltered, though Apple News has garnered many media outlets focus, even if they aren't able to earn much on the platform. At least not yet. Publications may be embracing Apple News at the moment, but that could change if Apple doesn't find a way to help them earn revenue rather than simply distributing their content. Apple has been heavily investing in the news platform in recent years, exploring possible methods of monetization and scooping up subscription service Texture, the latter of which has yet to be folded in to the News app.